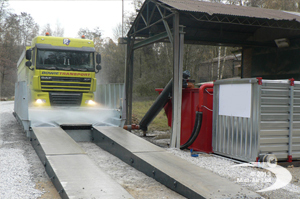 cleaning power (depending on model) and has a maximum throughput of 50 trucks per hour. 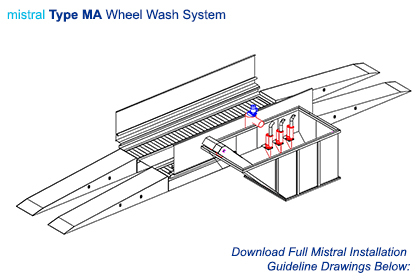 Washing takes place as the vehicle slowly drives through the system and the wash cycle is automatically started via an optical sensor and variably controlled with a timer. The system includes entry and exit ramps, a wash platform with an integrated screw-conveyor for transferring wash water and solids into the recycling tank, side spray walls and a recycling tank for water treatment with an integrated scraper conveyor for automatic sludge removal. 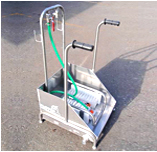 A specially developed nozzle system, consisting of bottom nozzles in the wash platform and side nozzles in the spray walls, ensures for an efficient water spray profile for targeted cleaning of the tyre profiles plus outer and inner wheel surfaces. The direction of the side nozzles can be individually adjusted to optimise cleaning. 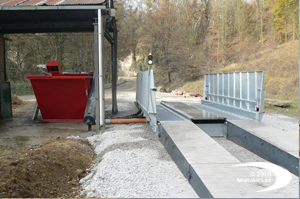 The angled rumble grids that are integrated into the wash platform construction shake vehicles’ wheels and flex open tyre profiles to supplement the cleaning effect. Washed off sludge is transferred via a screw-conveyor into the system’s recycling tank which is located adjacent to the wash platform. 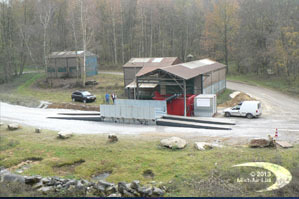 The waste sediment is automatically evacuated via the scraper conveyor and the water is circulated from the tank for reuse in the wash system. The water level in the tank is automatically regulated through a float valve. 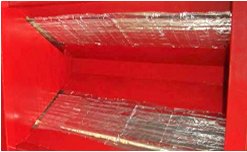 The use of a flocculent greatly increases and optimizes the sedimentation process and the flocculent is fed via an automatic dosing unit which is included in our standard scope of delivery. The MA System has a totally automatic operation. 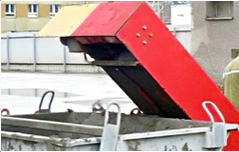 Customers’ personnel need only to periodically check and control the nozzles and conveyor system plus ensure a sufficient water supply to the recycling tank. A representative of mistral will instruct the customers’ personnel on routine checks and cleaning of the system during commissioning and handover. There is no excavation work at all necessary for the MA System. All that is required is a load-bearing, level surface onto which the System can be placed plus water and electrical power supplies in accordance with the mistral installation guideline drawing. 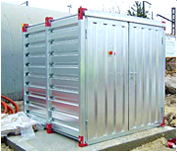 The complete System carries a standard manufacturer’s guarantee of 24 months effective from the date of installation. mistral guarantees a permanent supply of spare parts and an established after-sales service. We also design and manufacture bespoke and extra-large systems for dumpers, wheel-loaders, military tanks and other large vehicles. Maximum pump output: 3600 l/min. 5400 l/min.